Why did he have a stroke? 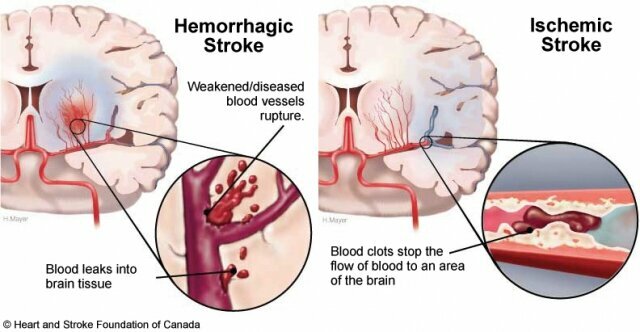 A stroke occurs when the blood supply to part of your brain is interrupted, depriving brain tissue of oxygen and food. Within minutes, brain cells begin to die. There are many factors that may contribute to having a stroke. The cause of some strokes is never known. The good news is that strokes can be treated and prevented, and many fewer Americans die of stroke now than even 15 years ago. High blood pressure — risk of stroke begins to increase at blood pressure readings higher than 120/80 millimeters of mercury (mm Hg). High cholesterol — a total cholesterol level above 200 milligrams per deciliter. Being age 55 or older. Race — African-Americans have higher risk of stroke than do people of other races. Gender — Men have a higher risk of stroke than women. Women are usually older when they have strokes, and they are more likely to die of strokes than are men. The factor with the strongest link to stroke is high blood pressure which more than doubles the risk of a stroke. Talk with your healthcare professional about what may have contributed to your stroke and actions you should take to avoid secondary strokes. I found something that will help you! Come Back Strong is a national movement centered on the blue return symbol for stroke recovery, hope, and survivorship. THERE ARE MORE THAN 6 MILLION STROKE SURVIVORS living in the United States today—a number projected to increase to 10 million by 2030. Come Back Strong is the first-ever movement to spark change for the stroke community. With your support, we will ignite a nationwide conversation to help others learn about stroke and provide support to millions of stroke survivors and their circle of support. Championed by National Stroke Association, providing stroke survivors with hope after stroke so they can begin their journey to recovery and Come Back Strong. The road to recovery looks different for everyone—but there is a road and there is a recovery—and it is emotional, physical, and spiritual. We asked and listened to stroke survivors and caregivers across the U.S. While they told us personal stories of unique challenges and conquests, there was one common thread. Stroke hits as a sudden and shocking loss that eventually gives way to hope. The visual strength of the blue return symbol signifying the process of stroke recovery, hope and survivorship. The return symbol is intentionally left open, reflecting the drive of survivors to return to their former self, and the opportunity that exists for a new normal. Stroke recovery doesn’t need to be a solo effort. From balancing a bank account and programming television remotes to driving stroke survivors to physical therapy appointments and helping them bathe, family members and close friends can make a significant impact on the recovery and everyday life of a survivor no matter how modest the task may seem. When Fred Brock, 56, suffered a series of strokes last year, his family assembled to care for him in his San Diego home. “It felt really good [to have the help] because we’ve always had a real close family and whenever there’s a problem, we rally together and take care of it,” he says. His daughter, Wendy, works as an accountant, so naturally she manages the family’s finances. His son works in construction and, “if anything breaks down around the house he takes care of it,” Brock says. And his niece regularly drives him to appointments, although Brock boasts he once again is able to drive himself. Much like Brock’s family, each member can lend a specialty to aid in a stroke survivor’s recovery and take over any tasks the survivor may not be able to complete by themselves. If you love to cook, offer to prepare meals. Are you skilled in troubleshooting computer issues? Teach a stroke survivor how to restart the WiFi and download helpful apps on their phone. Perhaps you’re a fitness buff and can visit a stroke survivor once or twice a week for a walk around the neighborhood. Even family members who live out of town can contribute with a variety of caregiving tasks that can be done from afar. Pay bills, send flowers and letters of encouragement, or serve as a lifeline via phone. Although Brock’s pride didn’t get in the way of family coming to his aid, not all stroke survivors openly seek and accept help. That’s a mistake, Brock says. How did you get started with public speaking? 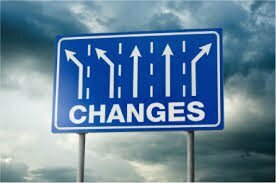 Early in Gordon’s stroke recovery, when we knew nothing of the journey ahead of us, we naively thought he would be fully recovered in 1 year. We thought we would have a party for all the wonderful people who helped us and we would all celebrate the end of a horrible year. At the 1-year anniversary of the stroke, Gordon was nowhere near recovered so we decided to postpone the party until the 2-year mark. He had to be recovered by then, right? At the 2-year anniversary, Gordon was still in terrible shape so we agreed we would celebrate full recovery at 3 years. At the 3-year anniversary, we finally understood that recovery was probably going to be a lifetime pursuit and that maybe we should just have the party anyway. Gordon agreed but he said he wanted to talk about the experience at the party. It took 6 months to write “My Brain Has A Hole In It” and 8 months for Gordon to practice enough to deliver the speech. On the 4-year anniversary, we had the party and Gordon spoke. The overwhelming feedback was that Gordon needed to tell more people—and here we are! When the stroke happened, Rachel was 14 years old and Tommy was 12. If those years weren’t hard enough, adding the chaos and devastation of their dad’s stroke pushed them in ways I never wanted for them. The threat of losing their father and their home as well as the loss our lifestyle and routines was life changing. It was painful, scary, and de-stabilizing. The good thing is that the kids were able to see their parents stay committed to their marriage, be supportive no matter the circumstances, and rely on their Christian faith in good times and in bad. Our kids are young adults now and are choosing their own paths. We are proud of them and the choices they are making. I don’t think we really know all the ways the stroke affected them. They don’t like to talk about it. Our hope is that they are able to move past the sad memories, have strong, stable marriages of their own, and appreciate the blessings of family and faith. If 100% is full recovery, how recovered is Gordon? I would rate Gordon as 80% recovered at the 7-year mark. His memory is quite good. We continue to see improvement in the right side of his body. While his right arm has movement, it isn’t useful, controlled movement. Language and cognition are the real problem. He has dramatically improved his ability to converse but extended thought and expression are still out of reach. Add any stress to the conversation and his language stops. So now, I am bringing Amazon to my party. How, you may ask? Let me know if this is useful, or if there is anything else you would like to see.